There are almost 46,000 spider species that have been recorded by taxonomists. Spiders can be found in many different shapes, sizes and colors however, they all share the same basic characteristics. Spiders have 8 legs, 2 segmented body regions, and a pair of fangs. Most spiders have 8 eyes, but some have 6 eyes and others are completely blind. Spiders also have an abdomen that contains a silk spinning gland, which is used to create webs for hunting prey or caring for eggs. Spiders are one of the most diversified creatures on the planet. They can be found on every continent except Antarctica. Spiders habitats range from deserts to rainforest. They can survive in almost any condition except below freezing temperatures. Inside residential homes, spiders favor areas where webs can be easily constructed to catch insects. The presence of spider webs typically indicates a current pest infestation due to the spiders ability to identify a constant food source. Male spiders engage in extravagant mating rituals to attract and prevent the often-larger female from eating them. Once fertile, a female spider can lay up to 3,000 eggs inside silk woven egg sacs. The life expectancy for most spiders is only 2 years however, the wolf spider can live as long as 20 years in captivity. Spiders can last for long periods without consuming food. Some species of spiders can go as long as two years without eating. Most spiders are predatory, hunting prey with webs woven from silk produced from their abdomens. Spiders are considered beneficial creatures because they eat unwanted pests such as mosquitoes, earwigs and roaches. However some species of spiders are vegetarians, consuming only plant-based foods. Most spiders are harmless and cause only a minimal amount of pain and swelling if a human is bitten. Spiders are typically shy creatures and try to remain hidden away from humans and danger. The majority of spiders only bite humans if provoked or if they feel threatened. However, some spiders are extremely dangerous and can cause serious injury or in some cases death. The most dangerous spiders in the United States are recluse spiders and widow spiders. 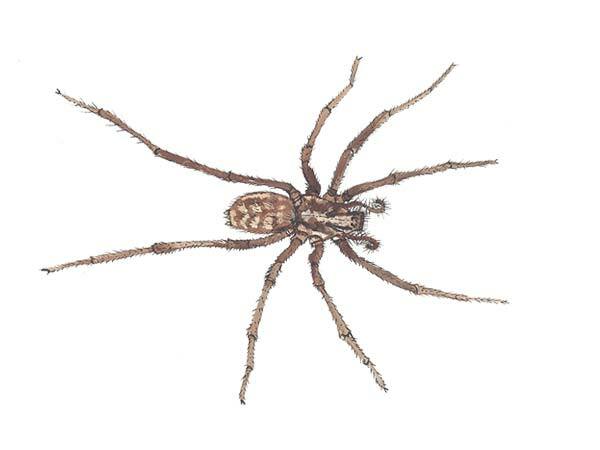 The recluse spider bite causes a reaction called loxoscelism; resulting in headaches, fever and sweating. The widow spider injects neurotoxic venom, which causes latrodectism. Typical reactions include vomiting, fever and cramps. If bitten by either of these spiders, please seek medical attention immediately. De-clutter inside and outside the home. Store firewood inside storage bins. Manicure trees and allow sunlight into the yard and home. Clean the eaves of the home with an extension brush and knock down existing spider webs. Treat the eaves of the home with a web eliminating spray to prevent future spider webs from developing. Spiders feed on insects such as roaches or silverfish. Keep the home in a sanitary condition and keep food stored properly to discourage potential spider food sources from entering the home. Treat the outside perimeter of the home with a long residual insecticide. Apply the treatment under the crawl space, under decks and along the edge of the home. Treat the inside perimeter of the home with insecticide labeled for indoor use. Aerosol cans are useful for tight fitting areas. Focus on the baseboards, window frames, doorframes, cracks and crevices. Dont delay! If you see spiders , call us today for a free inspection. Cloud Termite and Pest Control services Sarasota spider control, Siesta Key spider control, Longboat Key spider control, Gulf Gate spider control, Lido Key spider control and surrounding areas.